As a lot of you know I love pens especially for my studies! I usually carry a lot of extra pens in my purse and in my car, you never know when you need one. I was so happy when I was excepted on this Smiley 360 Mission. 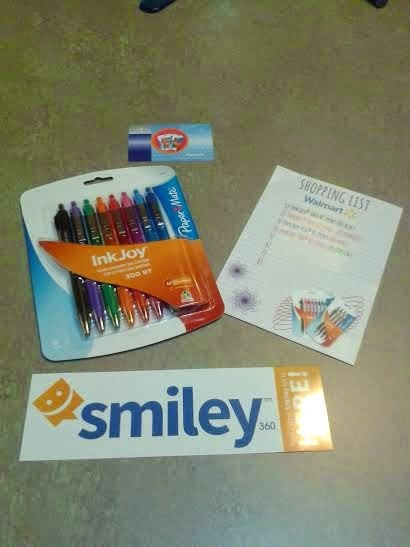 They send me a pack of 300 rt pens and a five dollar gift card which I went and bought another pack but it was the 550 rt pens. I love the way these pen write they remind me of the old school colorful pens and they have a unique writing to them. This pack is the medium point which works well me the colors are nice and bright. Also I love that they come with the rubber grip on them for smoothness on your fingers. Here is my demo and more on my review on them. *I received this product complimentary for testing purposes in exchange for my honest and unbiased review, regardless I only recommend products or services I use personally and believe will be good for my readers. All opinions are 100% my own. A pen with a good stylus makes drawing or calligraphy on tablets easy. The rubber tip is one way of ensuring that the tip will glide across your screen.